A retired man from East Lothian can now turn his dream of building a house for his wife, who has arthritis, into reality after winning more than £5m in the Lotto. 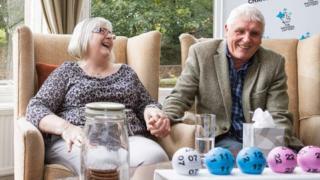 Tommy Parker, 68, and his wife Linda, 67, shared a £25m prize in the Lotto must-be-won draw on Wednesday by matching five numbers and bonus ball. Mrs Parker finds getting around unaided difficult. So her husband wants to have a house built without stairs. Mr Parker has, however, continued to paint his kitchen despite the win. He said: "I know now that I am a millionaire I can get someone to do this for me, but I've started the job so I'll finish it too. "I need to occupy my time with something while I think"
Mr Parker has always played the lottery and bought his ticket from the same shop, at roughly the same time, for the last 16 years. His numbers were a combination of family birthdays, with the exception of the number 44 which he chose as it "seemed to come up" and he thought it might be a winner one day. He said: "We had gone to bed and I checked the winning numbers on the TV. "I knew straight away we had five and woke the wife to tell her I thought we'd won some money on the lottery. "I checked again and realised we also had the bonus ball too and the jackpot had rolled down to everyone who had these numbers." He added: "My son-in-law, who is a builder, always said that when we win the lottery he will build us a place. "I can't believe that this is real and we can actually do it, but we hope to stay in East Lothian as we love it here"
Originally from the Newcastle area, the couple also plan to look after the children and their grandchild, and hopefully go on a cruise if they can find one that is suitable. The Lotto jackpot has to be won in the draw after the jackpot reaches £22m. If no-one matches all six main numbers then the prize rolls down to the next prize tier where there are winners. On Wednesday it was players matching just five main numbers and the bonus ball who shared just over £25m. The Parker's winning numbers were 07 11 12 22 27 44. The couple bought their winning ticket from Z&S Choudhry, Links Road, Prestonpans, East Lothian.